I need you to finish that quotation ASAP please. We have received your quotation. I will present this to my boss at our next meeting and get back to you with a response ASAP. 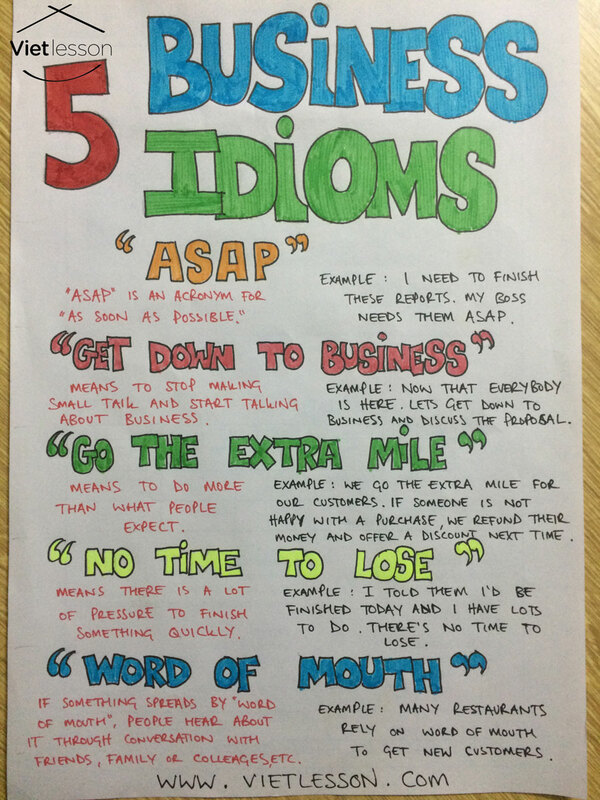 “GET DOWN TO BUSINESS” – Means to stop making small talk and start talking about business. Welcome to today’s meeting everybody. We don’t have much time, so lets get down to business. Hi everyone, just before we get down to business, I would like to welcome Emily to our reception team. I hope you will make her feel welcome. “GO THE EXTRA MILE” – Means to do more than people expect. I really love this hotel. The staff really go the extra mile to make you feel welcome. She is a very nice person and will always go the extra mile to help others. If you are willing to go the extra mile at work. Then you will have more change of gaining more responsibility and getting promoted. “NO TIME TO LOSE” – Means there is a lot of pressure to finish something quickly. I don’t have time today. The deadline for this report is tomorrow. There is no time to lose. We only have 30 minutes until the train leaves the station. We must hurry. There’s no time to lose. She has been taken to the hospital, with severe injuries. Let’s go, there’s no time to lose. “WORD OF MOUTH” – If something spreads by word of mouth, people hear about it through conversation with friends, family or colleagues etc. A friend of mine told me (word of mouth) about a new restaurant that we should go to this weekend. Oh no, I won’t go back there again. My friend told me (word of mouth) about how bad the customer service is there now. I don’t normally eat Asian food, but a friend recommended it to me (word of mouth), so I’d like to try it.